It is testimonials and support from customers like Rich that have made Limar the Helmet Specialist! Cyclists everywhere this summer will remain safe and protected while sporting innovative headgear researched and developed by Limar. With comfort and performance as its constant goals, Limar plans and designs each of its helmet lines to guarantee excellent functionality and exclusive style to cyclists around the globe. All of Limar's road and mountain bike helmets feature the company's In-Mould production process, allowing for a great reduction in helmet weight while ensuring tremendous impact resistance. The Super System 2 micrometric sizing wheel is light and easy to adjust for a perfect fit. The Cool Comfort soft pads inside each helmet are ergonomic, anti-allergic, and absorbent, while the specially shaped air flows are designed to help keep your head cool. 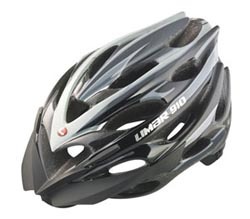 If road cycling is how you get around town, Limar has three helmet lines that will fit both your head and your budget. Limar's Carbon 969 Road Helmet is low-profile, extremely light (280 to 300 grams), and full of ventilation, thanks to 33 specially shaped air vents. The extra carbon inserts provide additional strength without adding weight. This helmet is available in two sizes: Medium (53 to 57 centimeters, approximately 20 to 23 inches) and Large (57 to 61 centimeters, approximately 22 to 25 inches). Select your favorite of four colors: Blue, Pink, Red, or Silver. MSRP: $153.99. With its small overall size, low-profile fit, and 25 air vents, the Limar Carbon 909 Helmet is fantastic for both men and women. It features a full three-piece cover for extra protection, and is super lightweight (290 to 320 grams). This helmet is available in two sizes: Medium (54 to 58 centimeters, approximately 21 to 23 inches) and Extra Large (58 to 62 centimeters, approximately 22 to 25 inches). Choose one of four sleek colors: Black, Blue, Red, and Silver. MSRP: $153.99. For serious riders wanting top technology at an affordable price, Limar's 737 Road Helmet is the perfect fit. Its two-piece shell provides extra protection within a neat and attractive shape, with 24 air vents and an extremely low weight (270 to 290 grams). This helmet is available in two sizes: Medium (54 to 58 centimeters, approximately 21 to 23 inches) and Large (58 to 63 centimeters, approximately 22 to 25 inches). Select one of four beautiful color combinations: Blue Black, Red Black, Silver Black, and White Pearl. MSRP: $99.99. When life makes you want to head for the hills, don't forget to take Limar along for the ride. These two lines of mountain bike helmets are ready for all the action and excitement no city can possibly provide! Limar's 910 Mountain Bike Helmet features an integrated fit-in front visor for optimal ventilation. This helmet is perfect for single-track and long-distance riders who think nothing of spending all day biking. The three-piece shell provides maximum protection and a very comfortable fit, with 25 air vents for when the going gets hot. This lightweight (290 to 320 grams) helmet is ideal for discerning riders who demand the best. This helmet is available in two sizes: Medium (54 to 58 centimeters, approximately 21 to 23 inches) and Extra Large (58 to 62 centimeters, approximately 22 to 25 inches). Choose one of three sharp colors: Black, Red Silver, and Silver. MSRP: $153.99. Strong enough for tough riding yet compact enough to be stylish, the Limar 747 Mountain Bike Helmet features a low-profile fit and 24 angled air vents. The front peak is integrated within the overall design, with a fit-in front visor and two-piece shell for added protection. With its extremely light weight (270 to 290 grams), this helmet will not impede your speed on the trails. This helmet is available in two sizes: Medium (54 to 58 centimeters, approximately 21 to 23 inches) and Large (58 to 63 centimeters, approximately 22 to 25 inches). Select one of three brilliant colors: Matt Black, Red Black, and Silver Black. MSRP: $99.99. For more information about Limar road and mountain bike helmets, please visit your favorite bike dealer, or contact ProNet Cycling at (800) 279-3793 and info@pronetcycling.com. Visit us online at www.pronetcycling.com.